« HOW TO GROW GREAT GARLIC – VAMPIRES BEWARE! 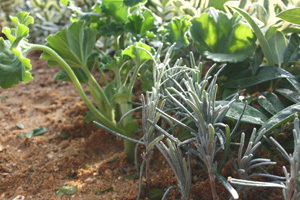 Growing your own plants from cuttings is one of the most rewarding aspects of gardening and much easier than you might think. It’s also a great way to make a bit of extra cash to perhaps fund another project in the garden! Here at Blackbirds we have a fairly large garden and we can’t afford to buy all the plants we’re going to need, so we propagate as many as we can ourselves using the same method my father taught me over 20 years ago. We have grown plants from cuttings in the past, and been very successful using this method, so I thought I would share it with you. First, I need to share something really important that will ensure you enjoy success with your cuttings. As soon as you detach a cutting from the parent plant it starts to lose moisture and very likely wilt. So my first tip is try to get your cutting into a rooting medium as soon as possible after it has been taken. If you can’t pop the cutting/s into a plastic bag with a little water, and then when you come to plant them, water them in and try to maintain some humidity around the cutting. The tried and tested method is to place a plastic bag loosely over the top of the pot and fasten with an elastic band. This one tip will increase your chances of success 10 – fold. 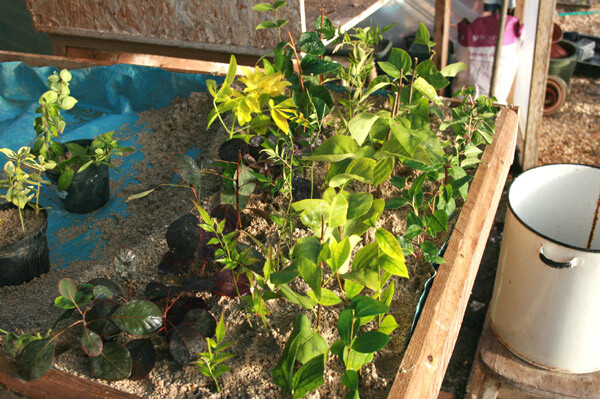 Plant cuttings have a built-in desire to survive and providing you plant them into a free draining compost mix and keep them at a reasonable temperature, not too hot and not too cold, softwood cuttings will produce roots in around 3-4 weeks. It does take longer for hardwood cuttings, but the process is pretty much the same, you just have to wait longer. I tend to use sharp sand for my cuttings, but a mix of 50 parts compost to 50 parts sharp sand works just as well and provides a small amount of fertilizer for when the cutting starts to grow roots. Another important thing to remember is, if your cuttings are to root they will need to kept moist (not wet). Professional growers use automated mist sprayers hooked up to a timer that deliver a light spray every 10-20 minutes, but a plastic hand held sprayer works just as well. At Blackbirds we’re lucky to have a sprinkler system in the Polytunnel, but you don’t need anything that fancy to make this work. Before we had the polytunnel we managed to root hundreds of cuttings every summer using nothing more than sharp sand, a plastic pot and a pot of hormone rooting powder. What should I use to root my cuttings? A simple 3″ plant pot with a plastic bag, or cut down plastic bottle to preserve moisture is all you need. 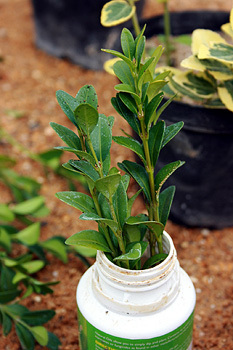 Simply fill the pot with your cutting mix to about a quarter of an inch below the top, and plant the cuttings around the edge. I usually get around 5-6 cuttings in one pot, but it really depends on what type of cutting it is. 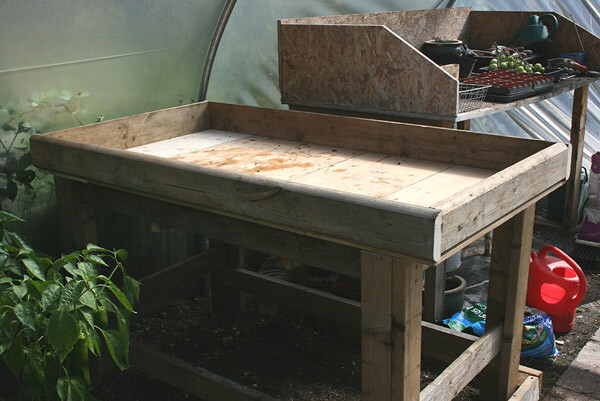 As we plan to produce a fair few cuttings this year we’ve built a propagating table out of some 4 x 2 timbers left over from the house build. We plan to build a cold frame outside one day, but as we lucky enough to have the Polytunnel we’ve allocated half for raising cuttings and growing plants. The design is pretty basic. The legs are made from lengths of 4″ x 2″ nailed together at right angles and the rails (cross pieces) are made from 4″ x 1″ fixed to the inside of the legs with 2″ screws. The base of the table is made from scrap pieces of plywood fixed to 4 1/2 ” x 1 1/2″ planks to make up the sides. The top sits on the frame and isn’t fixed, as the weight of the sand holds it in place. We’ve also added some plastic sheet to the inside to protect the wood, and drilled a few holes in the base so the water can run away. It’s really important that the cuttings don’t sit in water or they will rot off. There are lots of advice out there on what to use to root your cuttings in and I’ve no idea if any one method is better than another as I’ve had success with both. I tend to use sharp sand as it’s readily available, but the snag with sharp sand is you need to get them into a more substantial growing medium as soon as they have produced roots, whereas if you plant in a compost/sand mix they can grow on for some time without planting on. To raise the plants for our new Back Garden Nursery venture I’m going to use sharp sand as I can get a plentiful supply at the local quarry, and it’s cheap! I’m also planning to conduct a low tech experiment and try growing a few cuttings in 50/50 mix of Perlite and John Innes Number 1 potting compost, and a few in sharp sand, then publish the results. Next time ….. in Part 2 of Propagating Pants For Free I’ll go into a little more detail about how easy it is to take your own stem cuttings from your favourite plants and I’ll also share a few secrets that will help increase your chances of success.